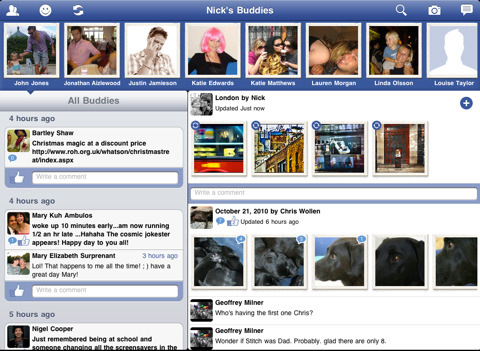 Since Facebook has yet to release an official app for the iPad, some developers have attempted to fill that gap. Buddies does a pretty good job of putting what’s going on right now in your Facebook universe in front of you with easy to use touch controls and scrolling, you’ll browse through everybody with effortless ease. A unique approach is taken for this application as it pre-downloads much of the content for you to keep your interaction with the app speedy. Across the top are all your friends (and their profile picture) who have had the most recent updates. I think I would like it if this area was about 25% smaller as it takes up nearly a quarter of the screen real estate. In landscape view, you can see everyone’s wall posts with time estimates as to when they were written. On the right side of landscape view, are all the most recent pictures that were uploaded. Combined, this provides an eloquent status updates feed and a pictures feed. It’s easy to scroll through the different content areas whilst navigating through Buddies. When you choose a new friend at the top, you essentially get all of their content focused in the status updates and photo area; instead of those areas showing all of your friends, it only brings in the friend you clicked. This is a nice feature and works very well. You can leave comments and “Like” anything just as you would be able to do on Facebook. You may also easliy post on his/her wall or comment on an existing post. Buddies for iPad works in all screen orientations which is always a plus because you don’t want to have to be concerned about how you’re holding the iPad (like you do the iPhone 4 😛 ). In portrait mode, it does appear to leave out the wall posts of your friends and only show the photo uploads. I couldn’t find a way to show one or other other in this mode without rotating the iPad to landscape. Buddies provides some other nice administrative features such as being able to configure multiple Facebook accounts, jumping to Facebook.com (which opens a new Safari frame, rather than exiting the application all together, really nice! ), you may refresh the content at any time to ensure you are current with the latest gossip. Additionally, you can search and browse for your friends, create a new photo album and add photos, as well as easily update your status from anywhere within Buddies. The app is very speedy overall and provides some great features. When using it, you’ll come across a couple of caveats. The first, which I find to be the most frustrating is that if any of your friends have their privacy set to not allow third party applications to view their content, you won’t be able to see their profile, comments, and pictures from Buddies since it is a third party application. This is of course not the fault of Buddies, but is just part of Facebook’s security customizations. It seems most people don’t have their privacy set this low, but from time to time you’ll come across someone that does and wonder why its not loading. The second caveat, which I think is a given, is you won’t be able to use other Facebook applications from the main interface of Buddies. You’ll have to go to the Facebook.com for that. This is purely meant to provide you a status and photos feed plus the ability to leave comments and “Like” stuff. Overall, Nick Kuh brings another great app to the iPad and one that covers an under-covered subject for the iPad, Facebook. 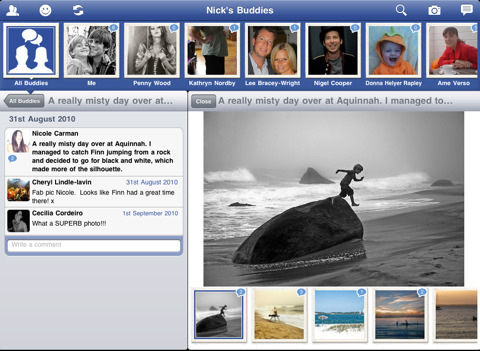 AppSafari review of Buddies – Facebook Browser was written by Kyle Hayes on November 15th, 2010 and categorized under App Store, Fun, iPad apps, Portals, Social. Page viewed 4478 times, 1 so far today. Need help on using these apps? Please read the Help Page.